Overwork, once a proud hallmark of the medical profession, now symptomizes systemic rot. Health-care issues got scant attention at the Democratic National Convention in Philadelphia, but outside the hall, a wave of labor victories at area hospitals showed the business of medicine is getting an injection of union action; medical workers who are sick of seeing their care devalued are building resistance to an epidemic of corporatization. Nurses at Hahnemann Hospital, part of the for-profit hospital chain Tenet, voted in January to unionize with the Pennsylvania Association of Staff Nurses & Allied Professionals (PASNAP) by an 82-percent majority in a National Labor Relations Board election, winning representation for roughly 850 nurses. Another unionization followed for hundreds more nurses at another Tenet facility, St. Christopher’s Hospital for Children. Around the same time, about 330 nurses and dozens more support staff at Delaware County Memorial Hospital in Drexel Hill held two successful union votes. The victories established collective bargaining units just ahead of a takeover of the hospital’s parent organization by another for-profit chain, Prospect Medical Holdings. In April, nurses at Philadelphia’s Einstein Medical Center voted to unionize following a hard-fought organizing drive, during which nurses decried dismal and unsafe working conditions. Organizers also clashed with the management’s anti-union campaign in which nurses were reportedly dragged into “captive audience” meetings with anti-labor consultants acting as propagandists to discourage them from organizing. According to PASNAP’s surveys of recently organized nurses, about seven in ten respondents “reported never having adequate staffing”; just four in 100 reported that “they always had safe staffing.” About 70 percent reported not having adequate break times, which are linked to continual understaffing and overwork. Speaking after an intense shift that left him exhausted, Einstein nurse Kevin Chilton recalled having to leave the next shift with an even heavier burden, since it was even more short-staffed than his had been. Adding to the stress is the management’s cost-cutting tactic of slashing technical-support staff, which leaves nurses with even more intense work burdens. Getting safe-staffing ratios codified into all union contracts is a top priority for PASNAP, but it’s not enough to go contract by contract, warns Eakin, when many facilities remain non-unionized and management keeps trying to squeeze staff to pump up profits. So PASNAP is pushing for state legislation to mandate staffing ratios at Pennsylvania hospital facilities. The proposed bill, which follows landmark safe-staffing legislation already enacted in California, would guarantee staff levels like a one-to-one ratio in trauma emergency care, as well as special protections for staff’s right to negotiate workloads and work assignments. Nurses aren’t the only ones stretched to the breaking point in hospitals and clinics. Even doctors are increasingly reminded everyday that they’re workers like everyone else. A national study on doctors’ work experiences has revealed massive work-related stress, with 46 percent reporting severe stress, up from 38 percent in 2011. One major factor cited was new regulatory pressures under the Affordable Care Act. A few overworked doctors just got a union of their own in Minnesota. An 11-member medical-professionals unit of Steelworkers Local 9460, which includes three doctors along with nurses and other staff, recently finalized it first contract at Lake Superior Community Health Center, a facility serving low-income communities in Duluth, Minnesota. The hard-fought contract came after years of internal struggle. Staff complained of a climate of anti-union hostility and intimidation—tensions that culminated in a contentious organizing drive and 42 unfair-labor-practice charges against the management filed with the NLRB. For all medical workers, overwork, once a proud hallmark of the profession, now symptomizes systemic rot. 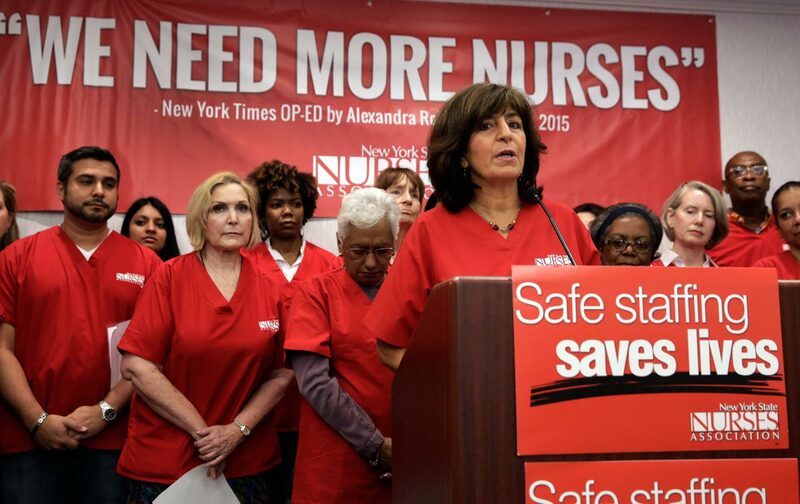 To tackle the root cause, nurses unions have become a leading voice in the movement for single-payer health care. Eakin argues that breaking the dominance of the medical insurance industry is critical for overhauling the social-service infrastructure as a whole.